If you like sweet and savory flavors with a kick, you will love Vietnamese lemongrass chicken! This is a dish you will find at most Vietnamese restaurants but it just never taste as good as homemade because they just never make it spicy or aromatic enough. I love using lots to of minced lemongrass because lemongrass smells amazing and it's even better when you stir fry chicken and lemongrass together and let all the flavors melds. I would highly recommend using bone in and skin on chicken, instead of just chicken meat. 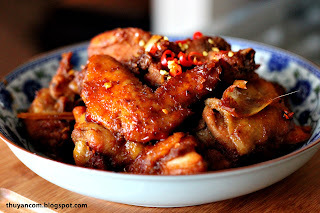 If you don't want to butcher the whole chicken you can definitely just use chicken wings. 1. Marinade chicken with 1 tablespoon of turmeric, 2 teaspoon of salt, 1/2 tablespoon of mushroom seasoning, 1 shallot minced, crushed Thai chili to your liking, and 2 tablespoon of cooking oil. Marinade for 1-2 hours. 2. Heat up a good amount of oil in a wok and start browning your chicken on low-medium heat. Make sure you turn your chicken so ensure all sides will get brown. 3. Once chicken are brown, season with 1/2 teaspoon of salt, 1 tablespoon of fish sauce, and approximately 1 tablespoon of sugar. If you like your food sweeter you can always add more sugar to your liking a little bit at a time. 4. Add minced lemongrass to the chicken and turn up the heat. Start stir frying the chicken and minced lemongrass to melds the flavors together. 5. Add more cooking oil to the chicken if needed. 6. Continue to the stir fry until lemongrass is fragrance and become crispy. 7. Add fresh chili at the very end for more heat. 8. Enjoy with steamed rice! A lovely recipe. Nice photos too.